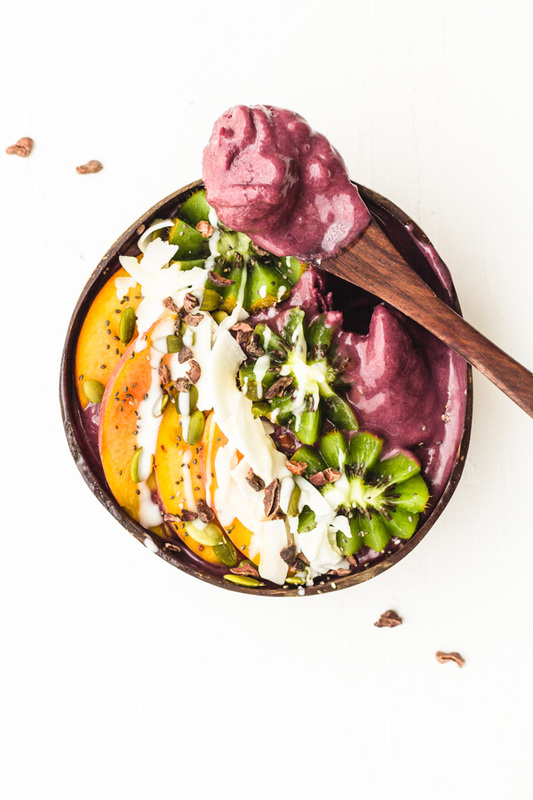 Homemade peach acai bowl with coconut butter drizzle on top. This bowl is perfect for breakfast, but don't let that stop you... feel free to enjoy this delicious acai bowl for lunch, dinner, snacks, and everything else in between. You've probably had one of this delicious acai bowls at your local healthy food restaurant/cafe. They are very popular, and with good reason. And today you're going to learn how to make your own, at home!! What's better than an acai smoothie breakfast bowl? One made at home by YOU! It's definitely more affordable, and you get to get as creative as you'd like with them! 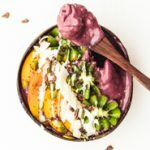 Last year when I first started this blog, one of my very first posts was about teaching you how to make your own homemade acai bowls. My methods haven't changed much since then, but luckily my pics have improved. 😛 If you want to check that article out for more breakfast acai smoothie bowl ideas, you can do so by clicking on the link. First things first, you're going to have to get your hands on some Acai puree or powder. Now a days, most natural food stores sell either frozen acai puree in the frozen food aisle or they have some type of acai dried powder available. I personally prefer the frozen acai puree for my smoothie bowls, but if powder is all you've got you can make that work, too! These homemade acai bowls are such a good breakfast (or any-time-of-the-day snack) because they are full of nutritious and antioxidants from the acai and the frozen fruits, it's super filling (warning: you might not be able to finish the entire bowl in one sitting 😛 ), and lastly, they are incredibly delicious - it feels almost like eating dessert! I always like to keep a batch of frozen bananas in my freezer so that I can have acai bowls ready to go in no time whenever the craving kicks in. Also, shout out to these amazing silicone freezer bags that I found on Amazon. They are reusable and more eco-friendly than using regular plastic zip lock bags. I've been using these a ton lately to store frozen bananas for my smoothies, pre-boiled sweet potatoes, tomatoes, and other veggies - it's a great way to meal prep too! You can find them here on Amazon if you are interested (affiliate link). Allrighty friends, That's all for today! See ya next week. Want to see more breakfast smoothie bowls? A quick and easy homemade breakfast acai bowl with frozen bananas, peaches, kiwi, and coconut butter drizzle on top. Add frozen acai, frozen bananas, and chia seeds to a high speed blender and blend until smooth. Add 1/4 cup of plant-based milk or water to help the blender a bit if needed. The less liquid you add, the creamier/thicker the acai will be, so keep that in mind. Serve acai mix in a bowl or cup, and top with fresh sliced peaches, kiwis, chopped nuts, cacao nibs, coconut shreds, chia seeds and a drizzle of coconut butter. Enjoy! Right?! Fresh natural food is beautiful!